So what makes us human and what does that mean for business? All organizations are run by human beings, each with his or her own personality type, prejudices, preferences and behavioral norms. Customers are human beings. To understand customers, you need to understand human nature and behavior. Products and services are purchased by human beings. To understand what products and services people will buy, you need to understand human nature and behavior. The sales process is primarily a process of human interaction… whether this interaction be in person, phone, mail, fax or online. Human behavior can be effectively managed through the appropriate structures and systems. However it is important to realize that while some personality types thrive on structure, others are paralyzed by it. Many “business” problems that crop up in your business could actually be human problems. When it comes to business, humans can be your biggest asset…or your biggest liability. The key points that immediately jumped out at me (specifically in terms of BPM and IT in general) were points 1, 5, 6, 7, 8. They illustrate something I have always believed about the challenges faced by IT and its adoption by the ‘Business’ and visa versa. So what? How can these aspects be harnessed and/or overcome? There is a lot of talk in the press about how the Business wants innovation and IT needs to be more responsive but at the same time they (IT and Business) do not respond well to the degree of change on either part that this requires. When IT works closely with business stakeholders this challenge can be overcome (well at least in part). If the communication and shared risk is not however well understood and/or managed initiatives inevitably turn out to be more difficult to deliver and many times do not deliver on initial expectations. In my readings, I came across the Satir Change Process model, named after Virginia Satir, an American author and psychotherapist. Her model is best represented in the diagram below which describes Performance fluctuations as a result of change. These steps were Satir’s way of discussing the process of change. Note that individual in this case can be interchanged with group (in the business context). Status Quo (White and Grey)– The status quo in Satir’s theory is the normal or accepted knowledge. This knowledge is accepted and comfortable for the individual, and the individual generally has a vested interest in keeping the state of things the same. Introduction of the Foreign Element (Transition area between White and Red)– The introduction of the foreign element, is the stage in which a new or foreign piece of knowledge is brought to the individual’s attention. The individual is often unsure of the new knowledge and may at first reject it in the stage below. Chaos (Red) – Chaos is the stage in which the individual tries to grasp the new knowledge that may either expand or contradict the status quo. During this stage the individual may become confused by the new knowledge and may reject it outright in an effort to protect the status quo. 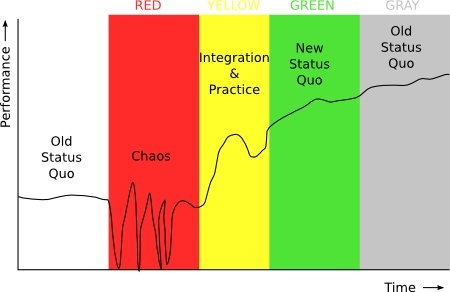 Practicing (Yellow)– Practicing is the first stage of integration. The new knowledge is used in practical application and the individual establishes a familiarity with it. The individual also ties the new knowledge to already accepted information or past personal experiences. New Status Quo (Green) – The new status quo is the stage when the previously foreign knowledge becomes part of the individual’s new “reality”. The knowledge is accepted and becomes part of what the individual considers normal. How does this relate to BPM and other IT initiatives? Recently I have posted on how an itterative approach to BPM development and implementation can deliver incremental business value. This approach is very tightly aligned with that of change management in an organisation. In my experience, the challenge faced by both IT and Business is the age old one of “if there is no immediate problem to be solved, don’t try and fix something that is not broken”. No matter how tempting it is to introduce change, if the immediate problem and the benefits are not well understood an existing/potential project tends to turn into a cycle of continual recalculation and justification rather than a vehicle for ongoing delivering success that can be built upon in future. This cycle of disillusionment can also act as the ‘hose of cold water’ (using the monkey analogy) that over time means everybody loses out. To break out of this self perpetuating cycle people in the organisation have to take a risk and thereby start the process of change. The question to be answered however is what and how big is the reward? That said, if there is however a clearly defined business problem that needs to be addressed, and it can quantified in terms of ROI a BPM project or any other initiaitive both IT and Business are in a much better position to deliver success. This entry was posted in BPM, Business Strategy, Random BPM & Related Thoughts and tagged BPM, BPM ROI, Business Performance Management, Business Process Management, Business Strategy, Change Management, ROI by Ian Louw. Bookmark the permalink. Thanks for this paper. Also pointing out the natural trend for human in changing, which is not the case of current process management solutions and their rules engines still quite rigid. As a consequence, BPM can’t fully support business expertise today. Recently, a new generation of rules engine called Intègre has been developed by Normind, French company. This groundbreaking technology embeds business best practice to guide business executives like a GPS : wihout constraints, accepting inconsistency and incompleteness in a reasoning. One of the major consequence is the capability to observe real pratices, to analyse them and to detect business needs regarding process management. I won’t say anymore because I don’t want to use this post a sales forum but many BPM experts consider current BRMS as a real limit for human/business integration in process management. As you point out, the two types of changes can be applied independently but in my opinion, I would say that they are much more powerful when combined. I would argue that incremental change is a result of stringing together small steps of change. This ensure that risk and expectations can be managed in a way that is appropriate for the given situation. The accumulative result is a major step change for the business. The alternative is to take the “big bang” or as your refer to it major change approach. Personally I have seen that in the situations where this approach has been adopted it resulted in very poor realisation of benefits. This was often due to decision makers not really having a total (detailed) grasp on the problem they were trying to solve (due to it being viewed at the macro level) or understanding the tangible value that will be delivered in the short to medium term. it makes it much easier for the organisation to navigate the adoption of the change. Taking this approach ensures the best time and conditions can be put in place to facilitate the adoption of the change. That said, sometimes change is not something that can always be controlled and is often forced upon an organisation. There is no easy answer about how to deal with it but taking a incremental and iterative approach does ensure that it is possible to be more flexible and responsive to change. Thanks for the thanks, Ian. It is my pleasure to share what I have proven effective as a manager. I do so in the hope that more managers will adopt a bottom-up approach so that employees are treated with great respect rather than be demotivated and demoralized by their bosses. The stresses and anxieties created by the top-down approach are very damaging to employees and to the success of their organizations. Thank you for your comments and sharing your wealth of experience and insights on this subject. I am always interested in other peoples experiences in this area. I agree with your points that in most cases the Command and Control mechanisms as well as the need for management to control and/or be seen to control employees can have a very negative effect on individuals and projects. Having worked in large and small organisations over the years, I can safely say that this tends to be very common situation (in my experience) in large organisations that have a very large degree of middle management. They have often risen through the ranks based on project successes but generally have very little people skills. Not so in my 30+ years of managing people. The structures and systems were obstacles to human performance, not assists. They were created by top-down command and control managers who had no clue how to create the highest morale, creativity, innovation, productivity, motivation, and commitment. How true. The human problems are in the bosses who think they can effectively control employees rather than use every person’s ability to self-control. Very true based on my 30+ years of managing people. I started out thinking people were on average capable of X. After 13 years I found out that they were actually capable of 2X. After another dozen years I found out that they are actually capable of 4X, maybe more. That was managerial nirvana for me, in charge of a 1300 person unionized group in New York City. The basics of my methods are explained in articles on my website. Excellent description and analogies of incremental improvement in business processes – well done! I believe that incremental change and improvement has to become part of the culture of the way that businesses operate but there are (at least!) 2 types of improvement;- 1) Incremental (and – hopefully – continual!) improvement and 2) Step change / major change. Both are critical fro driving peformance improvement, and I believe that – when it is systematically implemented and followed through as part of the culture of a business – incremental continual improvement can be as important and productive for the business as step change / major change (if not more so!). Do you consider that “step change / major change” is a different model to what you have described above? If so, in what way?